While Ip Man and The Grandmaster covers the same individual, and started development at roughly the same time. The two movies takes starkly different routes to the big screen. The Grandmaster while visually pleasing, Ip Man is a more polished all around movie of the great Wing Chun master Ip Man. 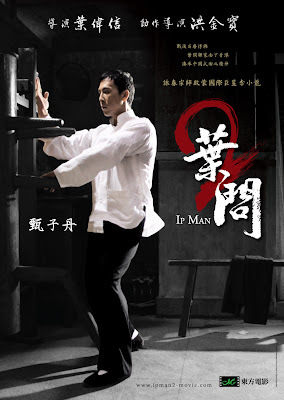 Ip Man which is loosely based on his life starts off in his home city of Foshan during the 1930s. We see how well respected he is as both a martial arts practitioner and a businessman. It's not until the start of the Sino Japanese War in the late 30s that his life is turned upside down and he is forced to accept that there are things even he cannot control. After the death of his friend, in one of the more touching scenes we see him opens up to his wife about how helpless and insignificant he feels in this world. This is where lead actor Donnie Yen really shines. 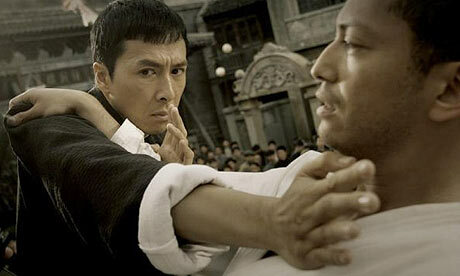 Donnie Yen as the iconic Wing Chun master could not have been a better fit with his mix martial arts background. He has won numerous Best Action choreography film awards in Hong Kong including in Dragon Tiger Gate or better known to U.S. fans as Jademan's Oriental Heroes. While well known in Hong Kong films, he is set to be in Crouching Tiger, Hidden Dragon II, The Green Destiny which should raise his profile in the U.S.. The fight choreographer for Ip Man however is legendary choreographer Sammo Hung who has worked with Jacky Chan on a lot of his movies. The two duo makes for amazing fight scenes in the movies that doesn't rely too heavily on special effects and thus seems more realistic. Besides Donnie Yen, majority of the other actors are well fitted for their parts such as Simon Yam as his friend, and Lynn Hung as Ip Man's wife. The set pieces are not as grand as The Grandmaster, but is more than adequate in setting the scene. As I've said before the story is very loosely based on Ip Man's life, which you may take away as a good or bad thing. Overall, I really enjoyed the movie and would recommend it. The story starts off with mostly a light-hearted tone and turns more serious after the start of the war. The plot for the most part moves along at a good pace with only some slow moments here and there. Despite the Rated R rating, the film should be appropriate for young teenagers. There are some, not a lot, violent scenes that may warrant the rated R rating. It's available on Netflix currently in Cantonese with English subtitles. Rating: 4.0 Stars out of 5.0 Stars. Donnie Yen as Ip Man (simplified Chinese: 叶问; traditional Chinese: 葉問; pinyin: Yè Wèn), Michael "Dan" Chan a sole practitioner of the martial art Wing Chun. Lynn Hung as Cheung Wing-sing (simplified Chinese: 张永成; traditional Chinese: 張永成; pinyin: Zhāng Yǒngchéng), Ip Man's wife. Hiroyuki Ikeuchi as Miura (Chinese: 三浦; pinyin: Sānpǔ), a Japanese general and a Karate expert. Gordon Lam as Li Chiu (simplified Chinese: 李钊; traditional Chinese: 李釗; pinyin: Lǐ Zhào), a police inspector and Ip Man's acquaintance. Fan Siu-wong as Kam Shan-chu (Chinese: 金山找; pinyin: Jīn Shānzhǎo), an aggressive northern martial artist who comes to Foshan to challenge other masters. Simon Yam as Chow Ching-chuen (Chinese: 周清泉; pinyin: Zhōu Qīngquán), a businessman and Ip Man's close friend. Xing Yu as Master Lam Zealot aka "Ip Man Cast and Crew" (Chinese: 武痴林; pinyin: Wǔchī Lín), the first son of a restaurant owner in Foshan, he is a martial artist and Ip Man's friend. He also also the teahouse. Wong You-nam as Yuan, the second son of a restaurant owner in Foshan who causes a lot of trouble. Calvin Cheng as Chow Kong-yiu, the son of the cotton mill owner, who is interested in learning kung fu. Chen Zhihui as Master Liu (simplified Chinese: 廖师傅; traditional Chinese: 廖師傅; pinyin: Liào Shīfù), a martial arts master.